Elsewhere on the blog I’ve suggested that the quantity and quality of São Paulo’s street art must rank amongst the finest – if not the finest – anywhere in the world. And by ‘street art’ what I’ve typically referred to is the imagery of pieces such as those of the 1º Museu Aberto de Arte Urbana do Mundo (World’s First Outdoor Urban Art Museum) in the north of the city. Yet, whilst I’ve lauded Sampa’s street art I’ve only painted half the picture (excuse the pun), because at the same time I’ve neglected another form of graffiti that is actually far more prevalent: pichação. It’s been on my ‘to-write’ list for a while to rectify this in-balance, but after reading a few posts on pichação and graffiti by my one of my favourite bloggers – Minhas Crônicas do Brasil – I’ve finally been inspired to do so. I’ll try not to steal Malvina’s thunder too much because she’s already provided some excellent insight, but there are a number of reasons why I think it’s worth another feature. 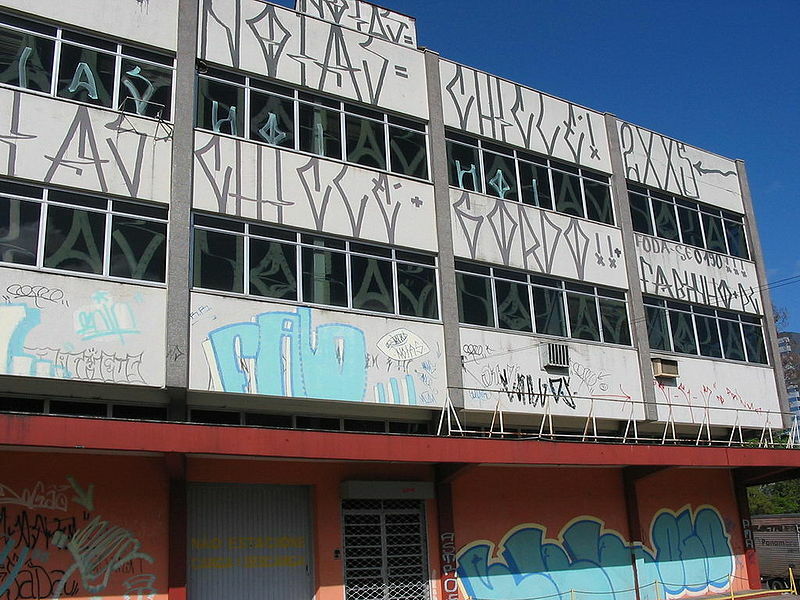 Firstly, pichação is something that intrigued me from the moment I arrived in São Paulo and saw it scrawled across entire walls – sometimes even entire buildings. And its omnipresence – a permanent and very visual feature of São Paulo’s landscape – means that any attempt to understand the city would be incomplete without exploring it, especially since it is said to originate from Sampa itself. So then, what exactly is pichação? And what does it look like? My initial observations were that it was a type of tagging consisting largely of an indecipherable hieroglyphic-like script. It was certainly different to tagging in London, which has more curvature and colour. In São Paulo, by contrast, it seemed to consist almost entirely of intensely straight black lines and jagged angles – making it challenging on the eye but somehow also strangely mesmerising. It’s not uncommon to see large parts of the centre of São Paulo like this. When I asked Brazilians for their thoughts about it their typical response was that it is simply mindless vandalism carried out by gangs. But, I thought, even if this is the case, why is it so much more ubiquitous and ‘in-your-face’ than other metropolises I had visited? Why such a unique form? And why do its authors take such extraordinary risks to put it halfway up high-rise buildings and along the sides of bridges? It was only when I stumbled across this article on the São Paulo Time Out website, and then subsequent pieces like this that I started to find some answers. And then, like Malvina, I found the documentary Pixo* on Netflix, and later a version with English subtitles on Vimeo. Where does pichação come from then? And does it have a meaning? According to the documentary the origins of pichação can be traced back to simplistically graffitied anti-dictatorship slogans of the 60s. Then, when the dictatorship ended, a more ego-driven pichação emerged from the punk and heavy metal scenes of the 80s, with the pichação style you see today influenced by the logos and fonts of bands like Judas Priest and The Exploited. 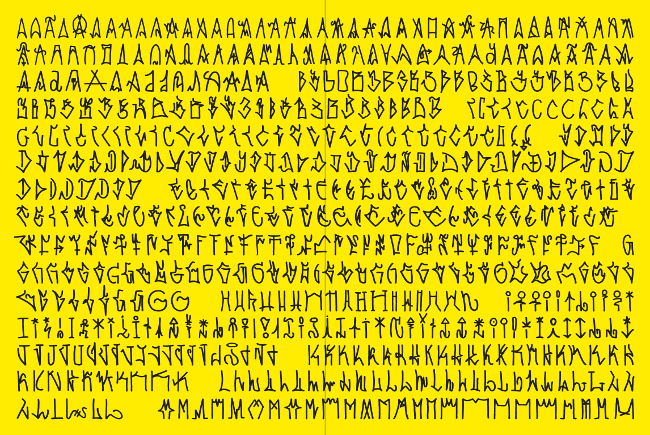 Example of a pichação alphabet. Fascinatingly, these logos were themselves inspired by early pagan and Anglo Saxon runes, meaning my unknowing Anglic eyes were actually being bombarded with symbols indirectly influenced by a thousand year old Anglo-Saxon alphabet. 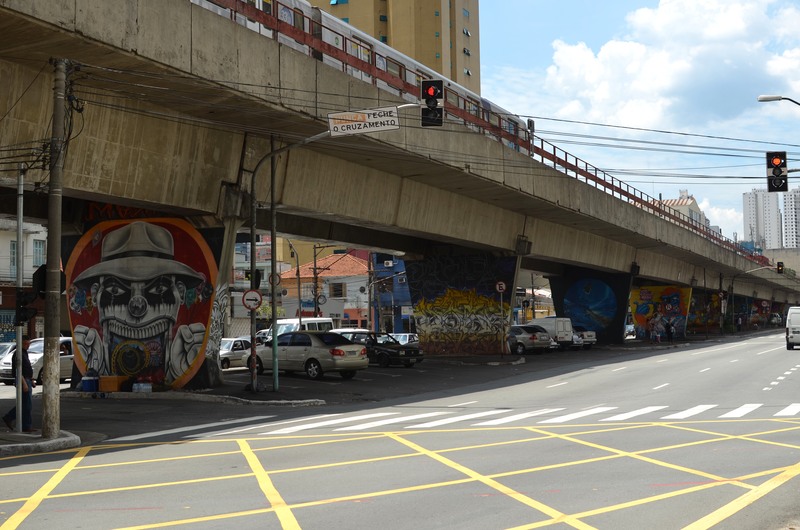 Increasingly, pichação became a battle between ‘pichadores’ to cover as much as surface space as possible, with the competition gradually making the locations more extreme – hence the high-rise buildings and bridges. As for meaning, pichadores seem to be no different from other taggers in that they develop an individualised tag that they use repeatedly around the city, with the idea being to make it clear ‘whodunnit’. Interestingly though, whilst the pichação itself may lack an explicit message, the pichadores explain that besides the competitive and adrenaline rush aspects of tagging their, main motivation is angst. Most pichadores come from largely from poor communities in favelas and their angst is one of people who feel marginalised by Brazilian society**. Pichação, we are told, gives the voiceless a voice and reminds the rest of the city that they are not willing to be ignored. *Some of the later scenes and interviews are filmed one block from where I live. **A marginalisation that is also a geographical reality, as unlike Rio most of the favelas in São Paulo are on the peripheries of the city far away out of notice. Comments: actually I’ve never payed attention about these “shapes” differences between those in London and in São Paulo… Interesting… Thks for telling us. Thanks Andréa, I appreciate it! I love the The Find article (not to mention the website–“promoting the diffusion of hip hop with jazz, funk, soul, and related genres”?–yum. I’ll be browsing here regularly, thank you!). I also happened to be lucky enough to find Wagner Braccini who was doing a graffiti installation at the CEMIG Centro de Arte Popular. He took some time out to talk shop with me and said that back in the day even aerosol was prohibitively expensive, so everyone worked with rollers and paints and shoe polish instead. Which lends itself to pichação, of course. Murals were done with house paint. He’s a great storyteller; he told me how he mixed paints to match aerosol colors and when he got his first paycheck he ran out and bought, of course, a whole stack of spraycans! LOL. The use of rollers is still quite common here especially when they make the tags really large on the side of buildings. It has a really cool stylistic effect although to be honest it didn’t twig this was how it was done until I saw the documentary. I can’t seem to help walking down the street now without looking out for pichação – I’m even starting to recognise the trademark tags of different picahdores! I still think I’m in a minority when it comes to appreciating it unfortunately. Like they said in the documentary though, it’s probably only a matter of time before some middle-aged art collector hangs some of it in their front room and it becomes trendy! I love the street art in São Paulo. There is one piece on Avenida 23 de Maio, close to the center, that I keep wanting to photograph…unfortunately it is in a precariously dangerous spot! Great post. Thanks!